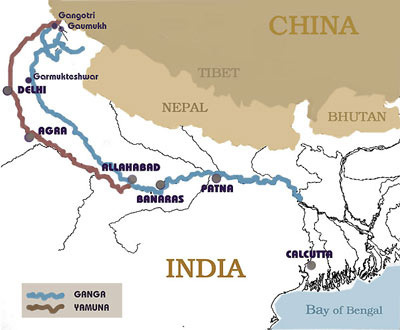 India is the land of several rivers. These rivers are personified as goddesses and worshipped and revered by all. It is a practice in Indian religion to view rivers, places and mountains as people and respect them. Every river is governed by its anthropomorphic form which is a goddess. Goddess Ganga (Ganges) is the mother of all rivers and exemplifies India’s culture and religious beliefs. She is an integral part of Indian pantheon and is believed to sustain life and clean all sins. 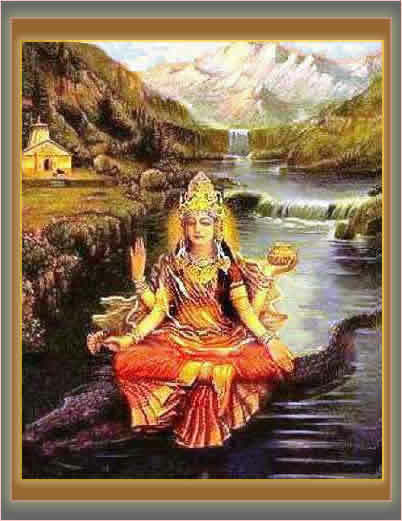 River Ganga is exalted at a supreme and most sacred status in Hindu religion because she touches the lotus feet of Lord Krishna, a highlight deity in the pantheon, when he appears as Lord Vaman Dev in Satya Yuga. This legend gave the river Ganges a sacrosanct appeal such that taking a dip in the river is believed to cleanse any pervious sins. Avatarana (Descent of the Ganga). According to the Holy Scriptures, River Ganga is believed to have originated from the divine waters of spiritual realm. She is believed to have descended in material world during the Satya Yuga when Lord Vaman Dev was covering the whole universe by his three steps. But she remains to stay in the heavenly planets until King Bhagirath practices austere penance to bring her down to the earth. The Maha Kumbh is celebrated in four cities of India: Allahabad, Haridwar, Ujjain and Nashik. This is the biggest festival and greatest pilgrimage in India witnessing millions of participants from across the globe to take a bath in the holy rivers during the auspicious duration. This video elaborates upon the story of the descent of Ganga on our planet and the historical places associated with her. The story is explained in detail with reference to the other historical events related to her. The copyrights of this video are reserved with the owner. The website exercises no rights on it.